What are Causes of Knee Pain? Knee pain can affect anyone, regardless of athletic ability or age. Knee Pain is often the consequence of foot and hip dysfunction. Due to the architecture of the foot and hip the knee becomes easily damaged as a result of compensation. The muscles, fascia, tendons, and ligaments supporting the knee will become irritated, and/or inflamed. When the mechanics of either the foot or hip are improper, the knee will alter or increase its range of motion which may result in pain or early degeneration. What are Symptoms of Knee Pain? 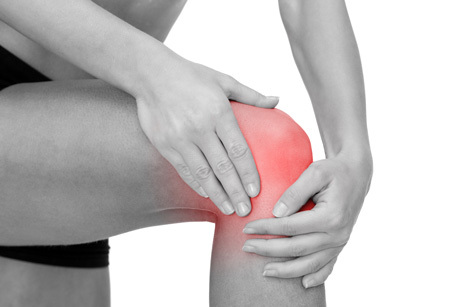 Knee pain is not normal, nor is it related to age, which is commonly believed. Symptoms of knee conditions may include: pain underneath the knee cap, pain on the inside or outside of the knee, difficulty walking/jogging or climbing stairs, feeling tightness/fullness, clicking/popping or locking of the knee joint. At ICT Muscle & Joint Clinic, we focus on treating the symptoms and root cause of your pain. The body is a dynamic, mobile structure and must be assessed and treated as such to create successful long-term outcomes. We employ the best scientific, evidence-based, treatment procedures using a combination of chiropractic, soft tissue therapy, and rehabilitative exercises. Surrounding all joints, there must be a balance between tension and compression of the ligaments, muscles, tendons, and fascia; when pain is present, it is due to an imbalance of these structures. This requires mobilization and release of tight structures, in addition to strengthening weak or inhibited structures of the painful joint(s) as well as the joint(s) above and the joint(s) below. Knee injuries are often the consequence of joint dysfunction at the hips and feet. Our doctors focus on a comprehensive approach geared toward lasting results.